After two weeks of not flying due to weather, illness, and work constraints, I flew my "long" solo cross-country flight on Monday, 15 November. My instructor called me Sunday afternoon to ask what had happened to me, and I told him that I was just about feeling well enough to fly. He said that he'd keep an eye out for good weather. He called again at 8pm and told me the weather looked good tomorrow (Monday) morning. I was set to meet the chief instructor for a 7am flight plan review. This meant that I needed to wake up at 0430 to get to the airport in time to check the weather and wrap up my flight plan. The trip was to be HEF -> Lynchburg (LYH) -> Richmond (RIC) and finally back to HEF. I started flight planning after the phone call and soon realized that Lynchburg isn't on the Washington sectional and I didn't have the Cincinnati sectional that I needed (doh!). Since it was too late to call anyone, I planned to go to the airport, apologize for dragging the chief flight instructor in early, buy the sectional, and reschedule the flight. 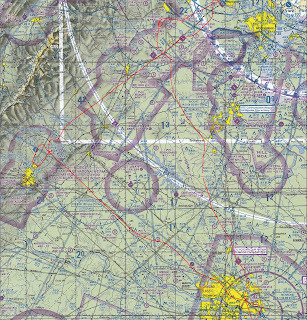 I hate being unprepared, and scrambling to finish a flight plan is not the way that I wanted to begin this flight. So it goes. Manassas was socked in with mist and fog when I got there. The chief instructor said that I wouldn't be going anywhere for a while, so finish up the flight plan and get ready to go. The weather forecast was bad for the rest of the week, so it made sense to try to get this trip done. It turns out there were no Cincinnati sectionals anywhere in the FBO, so he suggested that I change the plan for Charlottesville rather than Lynchburg. The planning process took me longer than I wanted, but the ceiling wasn't VFR until about 1130 EST so there was time. I took off around noon and made it outside Charlottesville without incident. The tower controller was managing traffic in both the right and left traffic patterns for runway 3. I was #3 in line to land, and the tower controller ordered me to report right base for runway 3. In a moment of confusion, I thought he told me runway 21. Several miles out and at traffic-pattern altitude, I called the tower just to confirm what he asked me to do. He straightened me out, sounding a bit irritated, and had me do a 360 for spacing. I was landing immediately behind a Boeing 717. It looked like the pilot was shooting instrument approaches for training: I think he did a touch-and-go. I was concerned about spacing to avoid wake turbulence behind this 100-seat regional jet, so I flew a slightly wider-than-normal pattern. While on about a 1 mile final, a Skyventures plane waiting to takeoff called the tower to make sure they hadn't been forgotten. If I remember correctly, the tower controller said with slight sarcasm that he was behind a "Cessna on 7 mile final." That was just a bit of hyperbole. 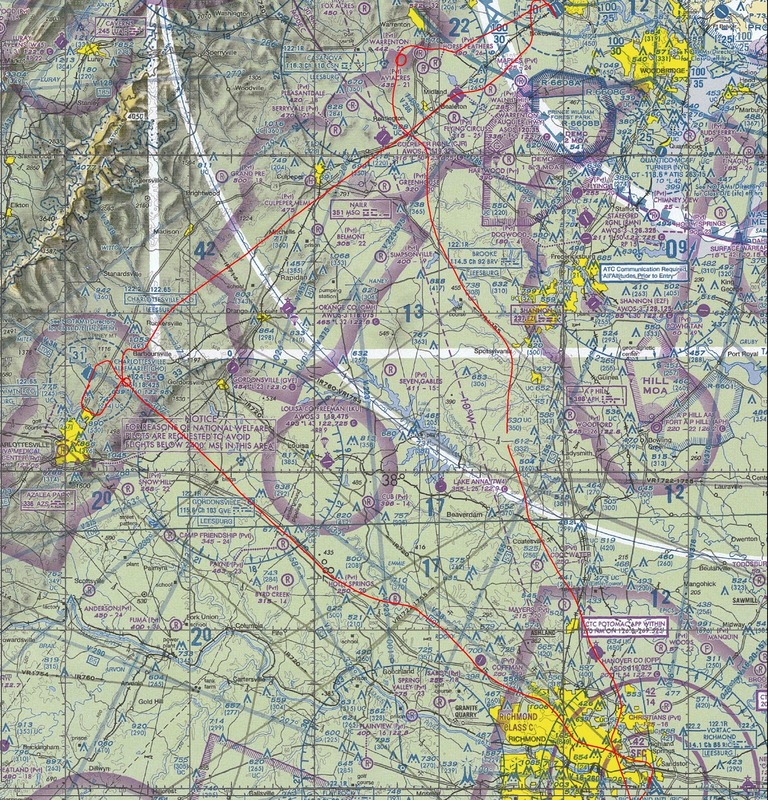 I am sensitive to pilots' irritation with students flying bomber patterns in slow, trainer airplanes, especially after reading recent complaints on the dcpilots mailing list. I usually try to fly a tight pattern. My only excuse here is that I don't have a lot of experience sharing the traffic pattern with fast jets. After landing, I called the tower to apologize and said, "I appreciate your patience." I was advised to fill the tanks at each stop, so I parked at the Landmark FBO and asked for 7 gallons of 100LL, which should fill the tanks. It looked like they accidentally spilled fuel on the plane and ramp and it took time to clean up. The interior of the plane smelled like gas for the rest of the trip, but I looked thoroughly and could find no liquid remnants. It felt like I was there an hour waiting for my ticket, which put me even more behind schedule. I had stopped for fuel here during prior dual and solo cross country flights, and it seemed to take a long time to get out of there in both cases. The people in the office were really nice, though. Prior to the flight, I was told not to ask for Flight Following on the ground at Charlottesville. After takeoff, when directed to switch to departure, I should instead switch to Flight Service, open my VFR flight plan, and then contact Potomac to ask for flight following. This would eliminate the usual request for a temporary frequency change to open the search-and-rescue flight plan. When Charlottesville ground control offered Flight Following without my asking, I didn't think twice about it and accepted. I was given squawk code. After being handed off to departure, I tried calling Flight Service on 122.65 MHz and was told "Standby. You are number 2." Thinking they forgot me after a few minutes, I called again and was told "Standby. You are number 2." So I dialed up 122.2 MHz, thinking that might be another queue, and was told, "Standby. You're number 5." At that point, I gave up and called up Potomac. I'm not sure what the backup at Flight Service was, as it usually takes less than 60 seconds to open a flight plan. On initial contact with Potomac, they said they had been trying to reach me for awhile. Lesson learned: if they say "Contact departure," do it. Potomac said that they can activate flight plans as well. I had assumed they opened it at that point, but it turned out that my search and rescue flight plan never got activated for this leg. I asked Richmond ground control for a run-up since there were planes all around me. He put me on taxiway Sierra and I had to make a tight 180 degree turn. Now I know the minimum turning radius of a Cessna 172. The ground controller had me taxi on Romeo and hold short of Alpha. I held short a little too far back, but it was fine because I had to let a United Express ("Waterski" callsign) go ahead of me. I took off on runway 20 and was given vectors by the controller. I was told to stay at or above 3,500 feet. The flight back to Manassas was uneventful, though the visibility was 5 miles at best. I needed at least 3.3 hours of solo cross-country time to reach my 5 hour minimum, so I did a few maneuvers over Casanova, VA before returning to land. I asked for "the option" from Manassas tower and contemplated doing a go-around, but after seeing all the headlights on Route 28, I decided it was getting close to sunset and made a full-stop landing. There are lots of lessons to take away from this trip. I won't make those ATC communications mistakes again. Looking at the GPS track, I did a slightly better job tracking the VORs, but I was still chasing the needles in a few places. I also think I did a pretty good job of staying ahead of the airplane: I had frequencies programmed well ahead of time, ATIS 20-30 miles out from the airport, an airport diagram in front of me at least 10 miles out, and descended to be at traffic pattern altitude in time. It was cool to have made this trip solo, and it has been a great confidence boost. I was on a high for about the next day-and-a-half.